Produktinformationen "AIDS can be conquered - the artificial origin, an early therapy and how it was boycotted"
AIDS is not an incurable disease. In 1991 Jakob Segal proposed an effective and inexpensive early therapy for AIDS, but this therapy has powerful adversaries. It would mean the loss of profits amounting to thousands of millions of dollars for the pharmaceutical corporations. Public debate on the merits of these therapeutic proposals has thus been suppressed for economic reasons as well as for the obvious political reason of concealing a major crime: the origin of HIV can be traced back not to Africa, but to research laboratories working for the Pentagon. A worldwide early therapy at the expense of the causes ist required. It must be won through against the present AIDS policy. 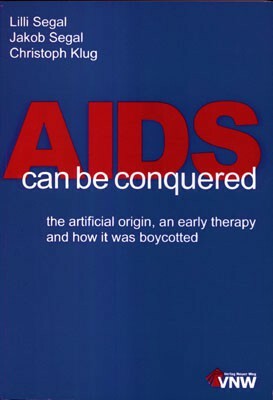 Weiterführende Links zu "AIDS can be conquered - the artificial origin, an early therapy and how it was boycotted"
Kundenbewertungen für "AIDS can be conquered - the artificial origin, an early therapy and how it was boycotted"